Went through the project and organized it better and cleaned up some prefabs and other similar items. Needed to go back into modeling for those box piles because my initial models had way too much surface area. At first I just reused another box piece I had, but it had more geometry inside of it for when you open it up, but all those box piles are static while they are in their shelves. Cutting down the polygon count by more than half, helped a lot with the baking times and the amount of light maps generated. The low quality bake for this scene took around 30 mints. Which is not bad considering that it spat out around 213 megs of light maps for my few thousand items that can be scene in those shelves. Adding the actual huge iris door now and laying out some wires and pipes. 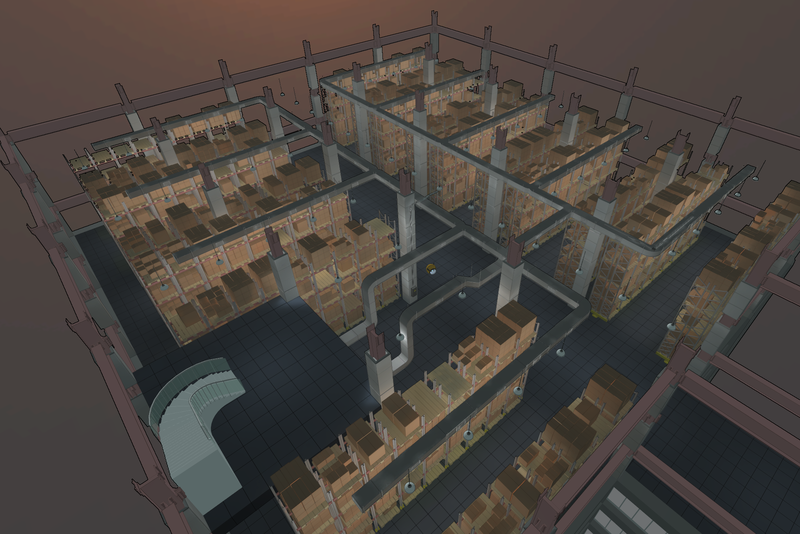 After that, it is the elevators and the actual pathways between this level and the other. When that is done, I am throwing in the robot to program. Which means I will be getting into some UI programming and implementing the puzzles.